Cynthia Jamin a devoted mother enrolled in sewing classes, spent countless hours practicing and took dozens of trips to the Los Angeles Fashion District all so she could create her daughters their dream dresses. The dresses though need to fit a pretty tall order. They needed to be beautiful, comfortable, reversible and most importantly twirly. Little did she know that all her hard work would lead her to creating her own business. TwirlyGirl started in 2007 and has grown into a full line of kids dresses for parties like these. These dresses can be found online and in boutiques across the country. The fabrics are hand picked and are of the highest quality. Plus these beautiful dresses are made right here in the USA! Read more about Cynthia's story here it is truly inspiring. I have an 8 year old daughter that despite being a tom girl loves to wear dresses. 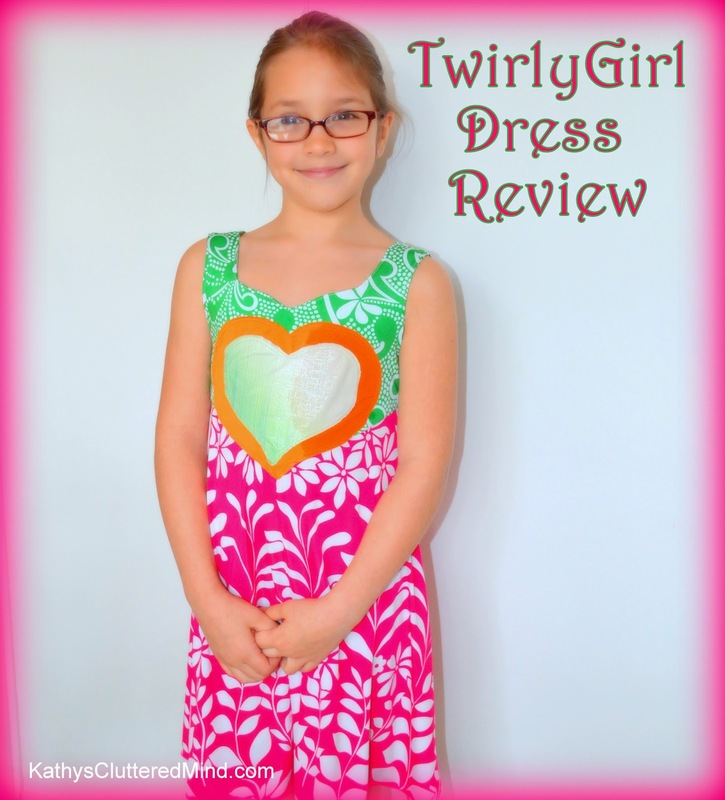 So when I heard about TwirlyGirl, a company that makes kids dresses for parties and casual wear, that are as unique as my daughter I knew we had to review one. We received a Wonderland Crush kids party dress to review. My kids love getting packages in the mail and they know that 9 times out of 10 the packages are for them. So when a package arrives it doesn't take long for it to be ripped open. I wish I would have video tapped Gwyn while she was opening her TwirlyGirl package. All TwirlyGirl dresses ship "gift ready" so once she opened the package she found a fabric bundle tied off with two ribbons. She opened the bundle to find her beautiful new dress. She let out a huge squeal followed by about 10 thank yous, and then immediately put the dress on and of course began twirling. • Double heart appliques, soft stitching. • Fully lined, Sweetheart neckline and V back detail. TwirlyGirl dresses are made right here in the USA and even the majority of the high quality materials are made in the USA too. All of the kid party dresses from TwirlyGirl are unique and extraordinary. And since each dress is made in limited quantities they almost "one of a kind" too. They feature vibrant colors and bold patterns which will fit any little girls unique style. Each TwirlyGirl dress including the one we received can be paired with a variety of accessories to create a unique new look each and every time you wear it. One day the weather was a little chilly so Gwyn paired her dress with tights and a long sleeve shirt. She even utilized the fabric and ribbons the dress was bundled in to create her own unique hair accessories. Gwyn also came up with a few other ideas for the fabric wrapper including using it as a headband, ascot, doll blanket, and twirling accessory. As a mother I love that TwirlyGirl dresses are very modest too. TwirlyGirl dresses not only look good, but they feel good too. Gwyn loved the feel of the soft fabric and the fact that the tag is on the outside so it doesn't itch her. She described the dress as being silky! The material is so comfy and amazing I have a really hard time getting her out of the dress. Even the seams feel amazing! Speaking of seams, all of the seams on TwirlyGirl dresses use a 4 thread overlock stitch so they are build to last. Yes these dresses will withstand even the roughest, toughest tom girls!!!! For moms you will like that the dresses are wrinkle free and simple to clean as well! Just machine wash in cold or warm water and tumble on low or lay flat to dry. I was a little worried about the fit because Gwyn is growing like a weed and I don't order clothing online very often. I went with a size 8 which is the size she has just started wearing. Well as you can see in the photos the dress fits perfectly. TwirlyGirl dresses are sized with a little growing room and use knit fabrics so that the clothing can grow with her. This is great for news for parents on a budget! Most importantly TwirlyGirl dresses are fun and little girl approved! The majority of the TwirlyGirl dresses are made with full or partial circle for maximum twirling. Gwyn loves her kids party dress and would wear it everyday if I let her. The dress is so versatile and fits her artistic, adventurous, bold, playful unique personality perfectly. She can twirl, dance, play and even sleep in her dress! The dress even looks great with her cowgirl boots. Make sure you visit TwirlyGirl because they don't just make dresses they also have skirts, tops, bottoms, and accessories. TwirlyGirl carries all of their products in sizes 2T-12. 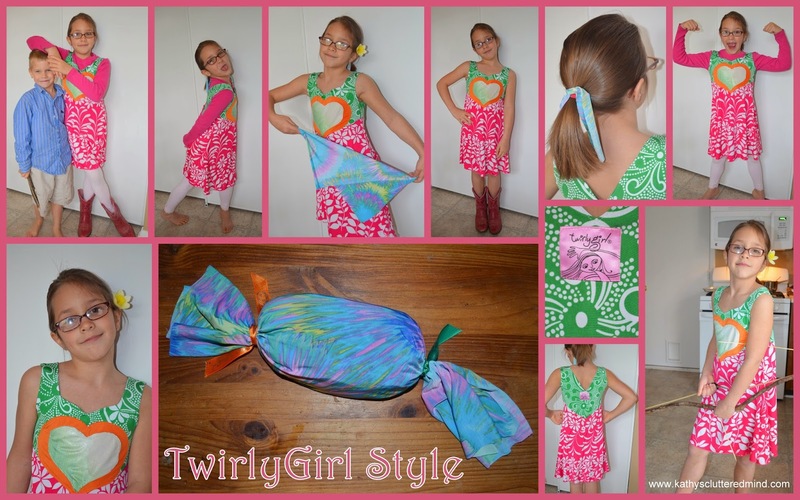 TwirlyGirl also has a Design Your Own Dress features where your little girl can style and design her own dress! Each custom design is reversible and your little girl will be able to choose up to four different fabrics. TwirlyGirl also offers a great fundraising program. Head over to the website to find out how you can start raising money for your child's school with the TwirlyGirl fundraiser program! -Have your daughter head over to TwirlyGirl to take the FREE Personality Quiz. Then come back and letus know if your daughter is a Genius Gnome, Wise Owl, Fairy Godmother, Flying Pony or Royalty! Gwyn's personality is a Flying Pony which I must say fits her perfectly. Plus she dreams of owning her own horse rescue some day so a pony is pretty fitting. -After the quiz head over to the TwirlyGirl Theatre where your children can listen to FREE audio stories for kids. Visit TwirlyGirl to view the entire collection and find the perfect outfit for your little girl. Prices vary. Guess what? TwirlyGirl is offering you 15% off your order with code JoyTG30 (case sensitive), Just apply the coupon during checkout. The coupon code does not apply to sale items, gift certificates or Design your Own Dress feature. And this code expires on 5/1/14, so HURRY! Wow! This sounds like a great program! Here in Alberta, if we are with a homeschool association and we fully align with the Alberta curriculum, we get $1550/yr per child to spend on curriculum resources. The year long subscription seems quite reasonable. I may keep this in mind for next year... I really want my children to learn French.